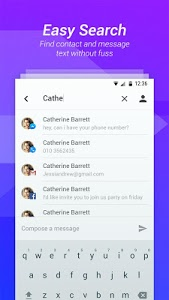 APUS Message Center is one of the best free unified messenger app for android. It helps unify and manage all messages from SMS, WhatsApp, Gmail and 3rd party apps. It includes message management, notification mamagement, contact manager, dialer and call log. It will completely bring you a fuss-free experience. 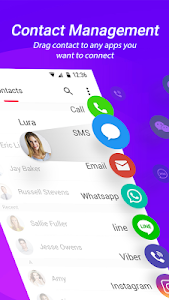 You can not only manage all kinds of messages (SMS, WhatsApp, Gmail, Yahoo mail, and 3rd party apps), but also find your contacts easily and make a phone call or view your call log in the new APUS Message Center. You only need this one application to grasp all the necessary functions. If you are always jumping between SMS, WhatsAppp, Facebook Messenger, etc. Please try APUS Message Center right now! APUS Message Center brings you a more intelligent, easier and smarter experience. 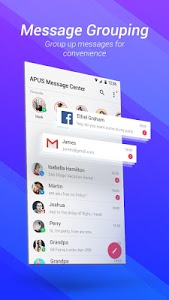 APUS Message Center provides not only free text service such as SMS, WhatsApp, Facebook and instant messages but also email apps such as Gmail. APUS Message Center fully supports dual SIM devices for SMS, so you won’t miss any important messages. And it is also easy to search for contacts and message texts from dual SIM card. 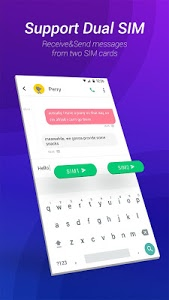 In APUS Message Center, you can find one contact’s multiple social information and connect with them by dragging to the app you want. Eg. SMS, Dialer, Line, WeChat, WhatsApp, Telegram, Viber, etc. 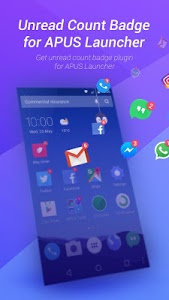 APUS Message Center also provides notification manager.It will clean your unimprortant notifications from your notification bar and help you get rid of messy notifications. After you check a missed call or chatting with someone, you can directly make a phone call and view your call log in APUS Message Center. Tired for your orderless notification bar? Try APUS Message Center now, you can check any notification (Gmail, WeChat, WhatsApp, Skype, Facebook messenger, instant messaging, etc ) you want by using APUS Message Center. 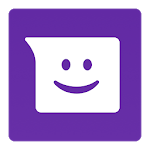 It will always organize your important messages so that you can read more simply and conveniently find all notifications at one stop any time. When there is a new message from SMS or WhatsApp, a message bubble will pop up to remind you to view the notification. 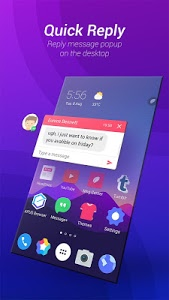 Then you can read and reply messages of SMS and WhatsApp from pop-up notification bubble, without exiting the current app, and quick reply the message directly. Notification bar will push so many notifications everyday, what if you miss some important messages? 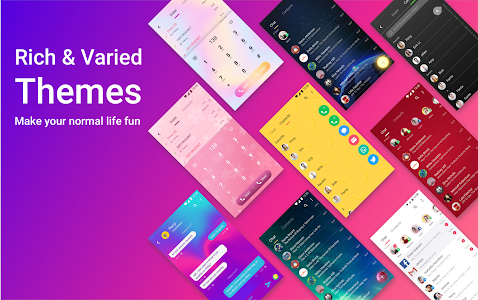 Don’t worry, APUS Message Center always reminds you about the messages from these app: Messages, Call, WeChat, Gmail, WhatsApp, Facebook messenger, Twitter, Snapchat, Skype, Tinder and so on. You’ll never miss important calls or unread messages (SMS, Gmail, Yahoo mail, social media apps notification)! Within just one second, you can find notifications, Messages, SMS, Contacts, Calls, email (such as Yahoo mail and Gmail) without fuss by entering keywords. All messages and contacts are collected in one app. 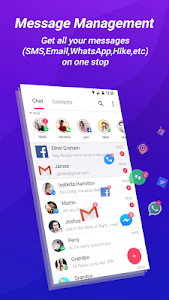 APUS Message Center is an intelligent, simple, easy and fast messenger and message management tool for android, comes with collecting all messages, such as SMS and 3rd party apps messages. You can enjoy contact manager, phone calling, regular notifications, dual sim support, quick reply, group messages. The conversation apps currently supported by APUS Message Center include but not limited: WhatsApp, Hike, Facebook, Facebook Messenger, Gmail, Yahoo Mail, Instagram, Twitter, Snapchat, Wechat, QQ, Skype, LinkedIn, Imo, Kakao, VK, Tinder, Yandex mail, Hangouts and more. Similar to "APUS Message Center—Intelligent management"